TTN 23rd Oct 2014: A cafe in Newcastle, NSW started a social media riot when they said their child-friendliness was limited. The resulting publicity across Australia, as parents and cafe patrons debated the suitability of kids in cafes, was priceless. It might prove to be a storm in a coffee cup but the operators of The Little French Cafe, at Broadmeadow in Newcastle, have received both applause and criticism after posting a “housekeeping” announcement on the cafe’s Facebook page. On Monday the following post appeared on the site: “If you are looking for a cafe with a children’s menu, baby chinos, a play area, lounges for your children to jump on, vast space for your prams, an area for your children to run rampant, and annoy other customers, whilst you are oblivious to them – then the short answer is No we are not child friendly,” the post read. Unruly kids unwelcome: The cafe’s original Facebook post, since removed. The response was immediate with parents and their sympathisers calling the post “arrogant” and an “attack on parents”, others have vowed to give the establishment a wide berth, The Newcastle Herald reports. However, a larger number of responses appeared to be in agreement with the sentiments of the post, saying they too were annoyed by out-of-control children in cafes and felt the operator had the right to cater to select clientele. By Tuesday the post, which the operator said was in response to a question about whether the cafe was child-friendly, had been shared on Facebook more than 100 times and a lively debate was well under way, but by 11am it had been deleted. 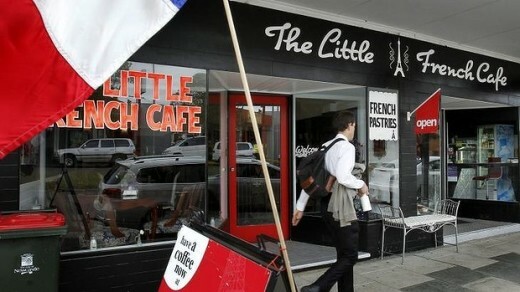 The Newcastle Herald contacted The Little French Cafe and asked the establishment’s operator to comment on the response to the post, but was told the only comment that would be made was a follow-up post on Facebook, which said the original post had been taken the wrong way. “I do really understand parents with kids. I am one. Which makes it even harder to sit by and watch what some children do, when they are here in my cafe, knowing that if I say something, I’ll be admonished for it,” part of the post read.